This card was an experiment for me. It is the first time I’ve used the Stitched Heart Envelope die. Overall, I like the card, but I look forward to playing with this die some more. 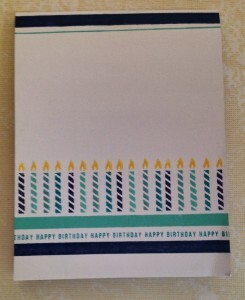 Extra Details: I began this card with card base made form white card stock. I stamped and white heat embossed the images all over the card front. 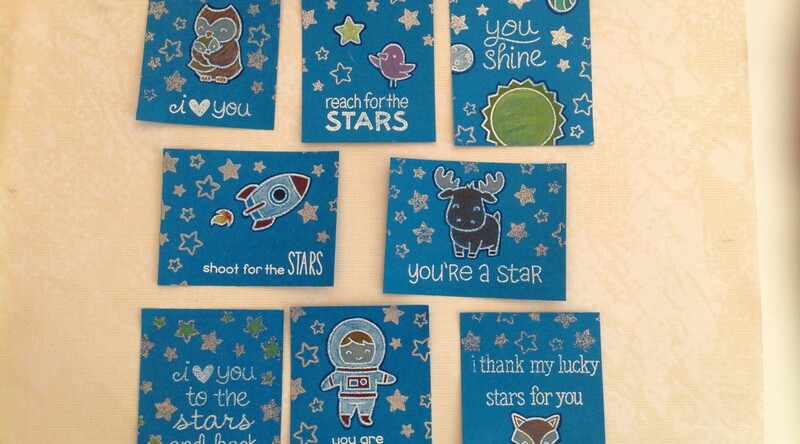 I used three shade of Distress Inks to ink blend the over the embossed images. 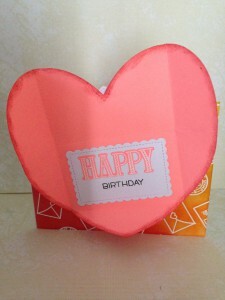 I die cut the heart envelope from a piece of coral colored card stock. 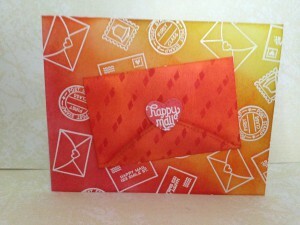 I added some stamping and ink blending to the outside of the envelope. My ink colors did not match the card stock as well as I would have liked, but overall it’s ok. I die cut the scalloped rectangle from some white cardstock. I stamped “birthday” in black. 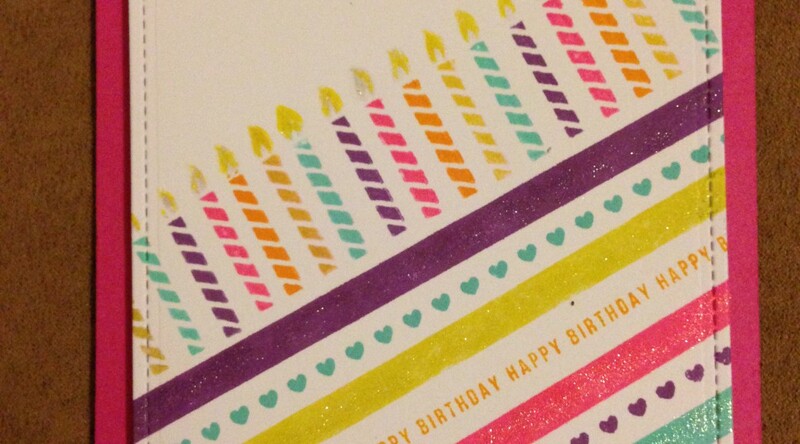 I also added the happy that I die cut and white heat embossed from the same card stock I cut envelope from. I adhered the white rectangle to the inside of the heart envelope. I die cut the small heart for the envelope set and heat embossed a sentiment on it. I added some of the same Distress Inks on that heart. I adhered it to the intent of the heart to act as a closure. Lastly, I adhered the heart envelope to the card front. 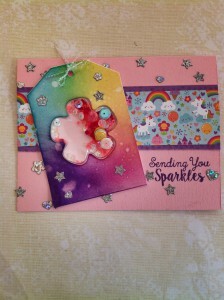 I wanted to play with the Simon Says Stamp September Card Kit today. I love the shaker tags that were included in the kit. I received a flower shaped tag instead of a balloon in my kit. Extra Details: I began this card with the flower tag. I ink blended some Distress Inks on the tag. I flicked some water on the inks to create some fun water drops. I also added a light pink Distress Ink to the inside of the tag. I filled the shaker pocket with some beads and sequins from my stash. Then I glued the tag closed. I added some iridescent twine to the top of the tag. 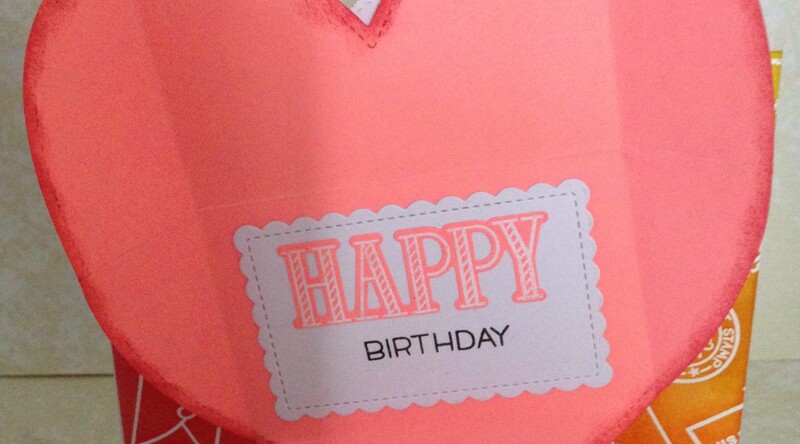 Next, I created a light pink card base. I wanted to use some of the patterned paper included in the kit. I found a design that I liked and trimmed it to an inch and a half. 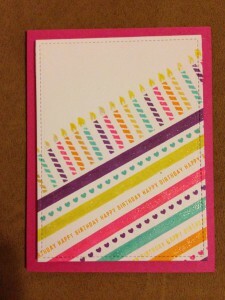 I added some thin strips purple paper to the edges to help the paper stand out against the pink card base. I adhered the strips to the card base. I adhered the shaker tag to the card base. Then, I stamped the sentiment in purple ink. As a finishing touch, I added some stars and hearts that I die cut from some silver glitter paper and holographic paper. I loved the Birthday Blues card I made so much that I wanted to try another version of it. This time I used more feminine colors. I also put the pattern at a diagonal for more interest. Extra Details: I began this card with a panel of white card stock. I used five colors of ink to stamp the images on the panel. I die cut the panel with a stitched rectangle when I was finished stamping. I adhered the panel to a pink card base with foam tape. Lastly, I added some clear Wink of Stella for some sparkle and shine. This is another set of lunch box notes I made for my kiddos. 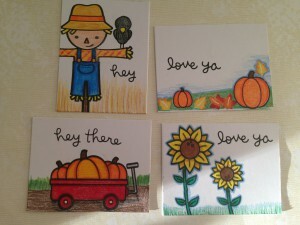 This time I used Lawn Fawn’s Happy Harvest stamp set for an autumn feel. Extra Details: I began with half a sheet of white card stock that I cut into 8 pieces. I stamped the images in black ink. I did use some colored inks for the colored leaves. I used colored pencils to color everything in. 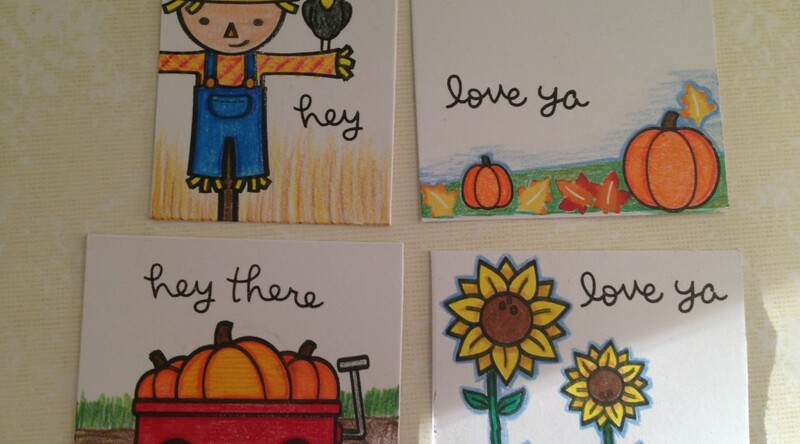 I used the same colored pencils to add the backgrounds on the cards also. Lastly, I added the sentiments from Lawn Fawn’s Flirty Frames. My kiddos have requested notes in their lunch boxed this school year. I decided to make myself a bunch of notes that I can just grab in the morning while packing lunches. I actually enjoyed making these more than I expected. The notes are smaller and faster to make which allows me to use more images at a time. Extra Details: I began this by cutting a piece of blue card stock into 16 pieces. I used some Versa Mark ink and white embossing powder to hear emboss the images and sentiments. 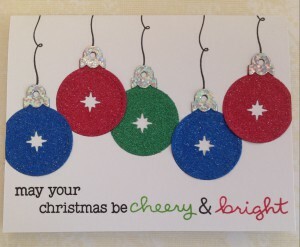 I used silver glitter embossing powder for some of the stars and silver embossing powder for others. I used color pencils to add color to all of the images. My husband’s best friends’ birthday was last week. My kiddos made him some birthday cards. They had such a good time playing with water coloring and resists. 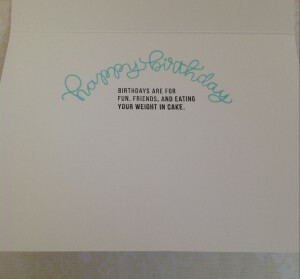 Extra Details: We began these cards with panels of water color paper that I had die cut with a stitched rectangle die. 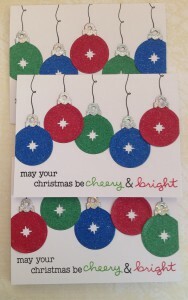 Each kiddo decided on their card design and I used Versa Mark and white heat embossing powder to create the designs. We used Distress Ink as water colors. I taped the panels down first. Then the kiddos painted on some clear clean water on their panels and began dropping in colors. We let the first layers of color dry while we had dinner. Then we added a second layer of color. After the second layer was dry, we added some splatters of ink. Once the splatters were dry, we adhered each panel to a coordinating card base with foam tape. The kiddos were so please with their creations. The current Lawn Fawnatics Challenge is a Fall Inspiration Mood Board. I love the colors that were included on the mood board and had to make a card with them. In the end, I made two cards. 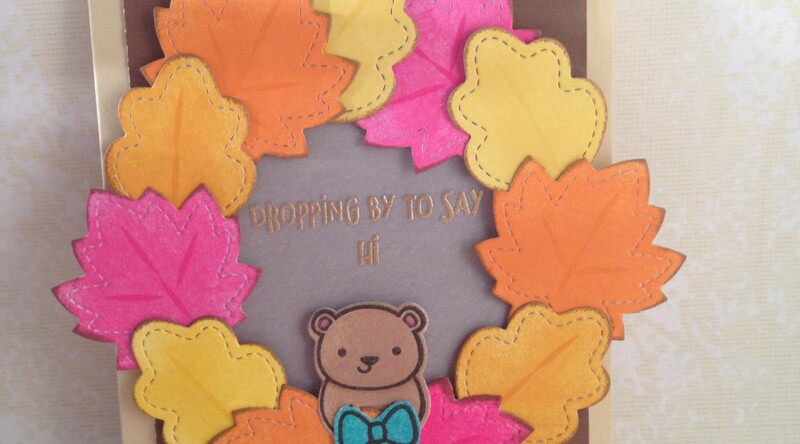 Extra Details: I began these cards by die cutting a bunch of leaves from some white paper. I used both smooth white cardstock and water color paper as I was trying to use up some scraps. 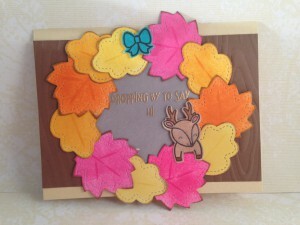 I used four Lawn Fawn inks to sponge some color onto the leaves. I used a Mini Ink Blending Tool and some brown ink to color all the edges of the leaves. I added some vein details with a line stamp and the same colors of ink. I stamped the bows on another scrap of white cardstock and used a Mini Ink blending tool to add the color with Lawn Fawn ink in Peacock. I fussy cut the bows. Then I began to look in my stash for a sentiment thinking that I wanted something simple and classy. Then, I found the new For You Deer stamp set and went the cutesy route. I stamped the front of the bear and deer and ink blended Lawn Fawn Doe ink over both of them. I used some colored pencils to add a little bit of detail to each. I used the coordinating dies to cut them out. Next, I die cut the largest scalloped circle from some velum. 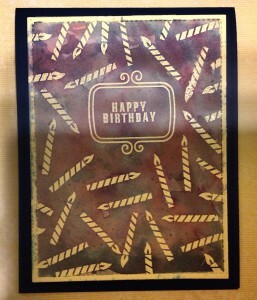 I stamped and gold heat embossed the sentiment on the velum. 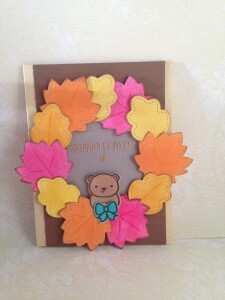 I used foam squares and glue dots to adhere the leaves around the edges of the velum circle to create a wreath. Once the leaves were adhered, I added the bows and critters. I found a pack of embossed paper in my stash. 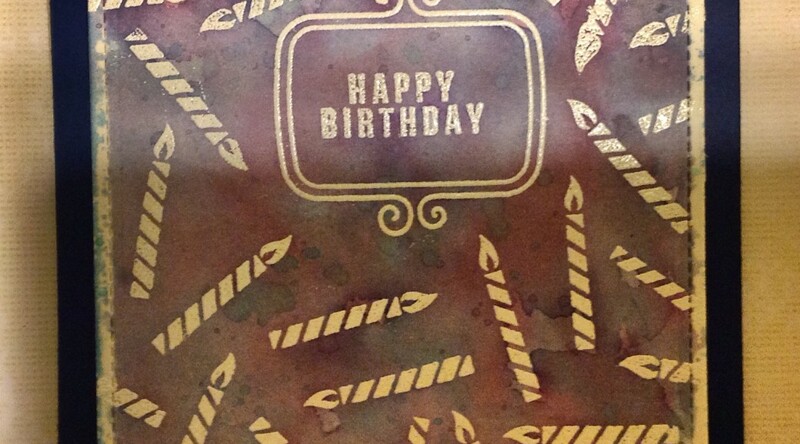 I used a sheet of brown paper embossed with a wood grain pattern as a layer for my cards. I cut the embossed paper to 3.75” by 5.5” and layered it on cream card bases. 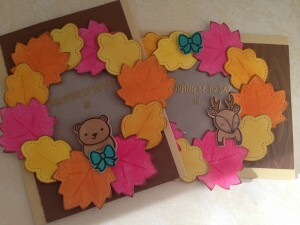 I adhered the wreathes to the embossed paper and the cards were finished. I LOVE the Simon Says Stamp Best Ever stamp set. It is so versatile and fun to use. 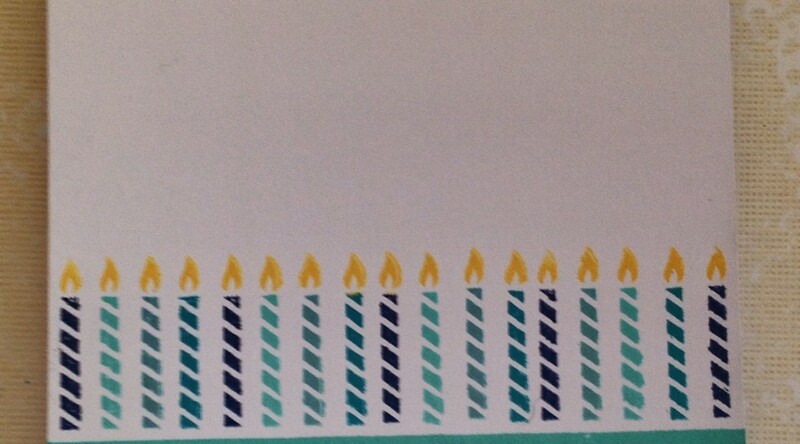 I made a very simple masculine birthday card with it today. Extra Details: I began this card with a white card base. 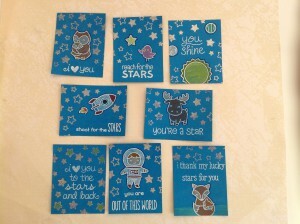 Using my MISTI, I stamped the strips in different shades of blue. 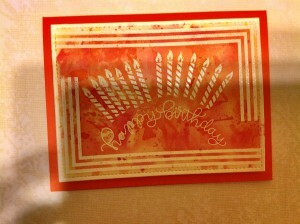 I also used the MISTI to stamp the candles. I added a sentiment to the inside of the card and it was finished. I just bought the new Lawn Fawn Winter Tiny Tags and couldn’t wait to play with them. 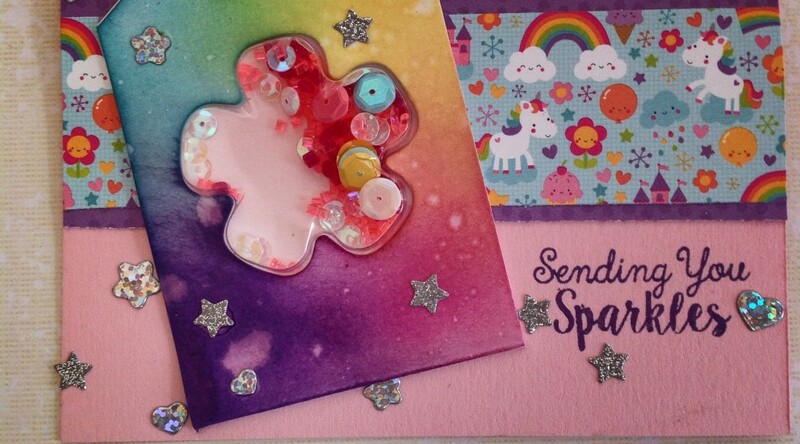 I used some adhesive backed glitter paper to create these cards. 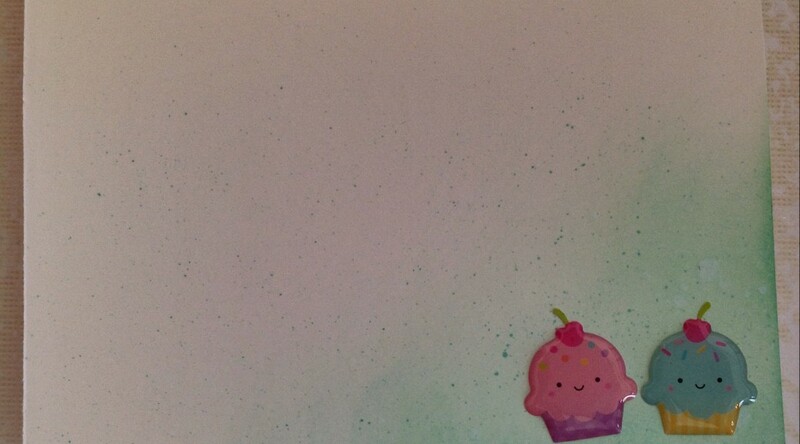 Extra Details: I began by die cutting the ornament from three colors of glitter card stock. 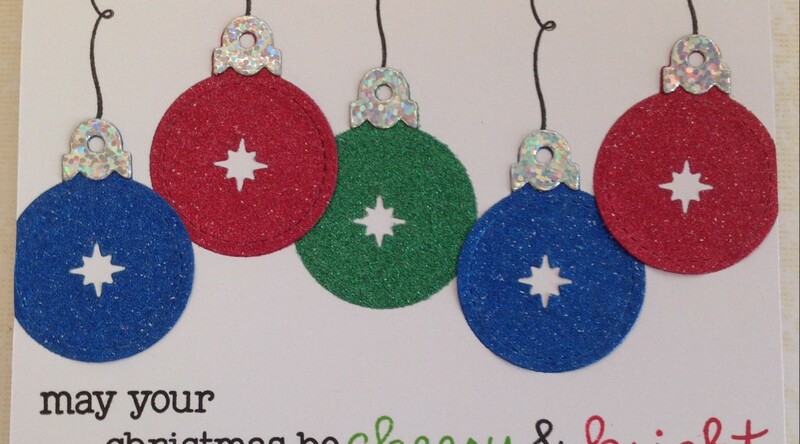 I also cut out the star in the center of each ornament for added interest. I adhered the ornaments to three white card bases. I stamped the stings using Lawn Fawn’s Scripty Sayings stamp set. I added a sentiment to the bottom of each card. For the finishing touch I added the holographic toppers to each ornament. I die cut those from some old packaging I had saved. My Simon Says Stamp September 2017 Card Kit just arrived in the mail the other day and I couldn’t wait to use it. This is the first card I made with the kit. Extra Details: I began this card with a white card base. 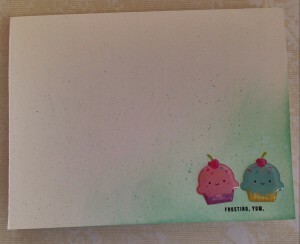 I used Cracked Pistachio Distress Ink and a mini ink blending tool to add color to the bottom right corner. I also flicked some of the same ink of the card base for interest. I stamped the sentiment in black ink and added the stickers. They are perfect to star in this clean and simple card. 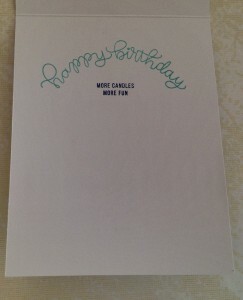 I stamped the happy birthday sentiment in an aqua colored ink on the inside of the card. I added the rest of the sentiment in black ink.